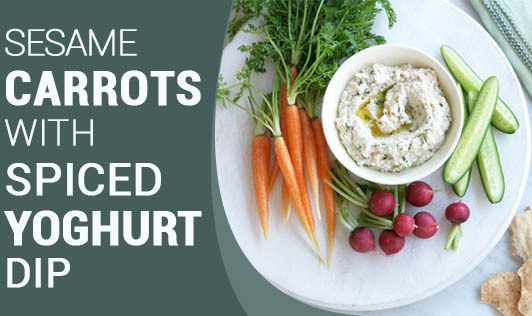 These appealing sesame-covered carrots served with spiced yoghurt dip make for a great healthy starter at parties. • Pour the hung curd into a bowl and whisk it along with the sugar until smooth. • Add paprika, mustard powder, black pepper powder, and salt to taste, and mix well. • Add some fresh coriander leaves, mix, and keep it to chill in the fridge. • Wash and peel the carrots and pre-heat the oven at 425°F. • In a bowl add 1 tbsp of olive oil, dried thyme, kosher salt, salt, and mix them together. • Remember to keep turning them halfway while baking. • 5 minutes prior to removing the carrots, toss in roasted sesame seeds and put it back in the oven for 5 minutes. • Once done, cool for 5 minutes and serve along with spiced dip.